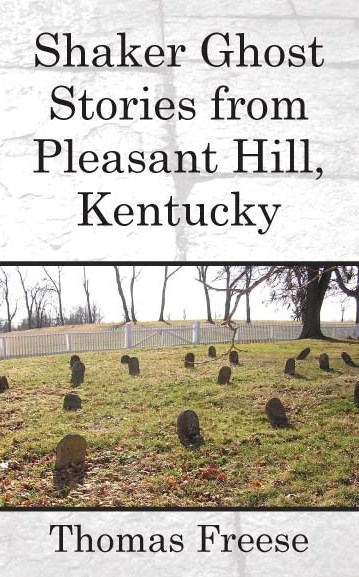 Shaker Ghost Stories is a collection of true experiences from the visitors to and employees at Shakertown, Pleasant Hill, Kentucky. Pleasant Hill has been 200 years in existence, and is one of the restored Shaker villages in the Eastern United States. The Shakers, or United Society of Believers in Christ’s Second Appearing, worked diligently to create a Zion, or heaven on earth. Their founder, Mother Ann, encouraged them to put their “hands to work and hearts to God”. While the Pleasant Hill Shakers have passed on, their legacy of spiritual devotion and material prosperity remains. The Shaker village is a peaceful place to visit and learn about Shaker life, to enjoy singing and overnight stays. Those who come find a spiritual touchstone in walking the land, hearing Shaker music, and marveling at their craftsmanship. Some of those who work or visit there have discovered that some Shaker spirits have perhaps returned to Pleasant Hill. The collection of odd occurrences reported in Shaker Ghost Stories include mysterious singing, phantom footsteps, appearances and disappearances of Shaker-looking people, invisible helping hands, and the sights and sounds of work and worship continuing at odd hours. The Shaker spirits seem to act much in character with their original dispositions—demonstrating faith, fervor, and a guardianship of their homes and land. Traveling East in 1990, Thomas Freese visited friends, looking to relocate from New Mexico. Thomas was intrigued by Shakertown and the lives and accomplishments of the Shakers. He moved to Lexington the following year, and in 1996 became one of the Pleasant Hill Singers. While learning and performing Shaker music, he heard his new friends often speak of their “Shaker experiences”, occasional and unusual happenings. Boosted by their encouragement, he spent the summer of 1998 taking notes and collecting acounts of the Shaker Ghost Stories.